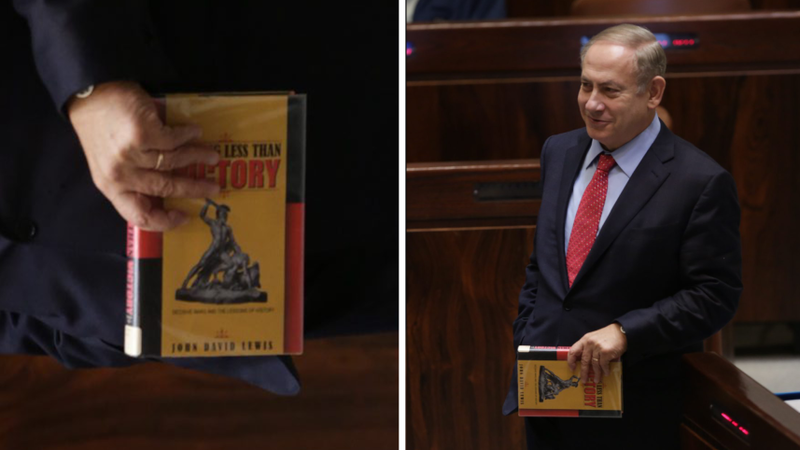 What is Israeli Prime Minister Netanyahu Reading? John David Lewis’ “Nothing Less than Victory: Decisive Wars and the Lessons of History” | John David Lewis Ph.D. The prime minister was seen in the Knesset chamber reading John David Lewis’ ‘Nothing Less than Victory,’ which suggests that successful military commanders who have achieved decisive victories have established stable peace. During Wednesday evening’s long Knesset debate in the run-up to the final vote on the 2017-2018 budget, a number of Knesset members, including Prime Minister Benjamin Netanyahu, whiled away some of the time in the Knesset chamber catching up on reading. In the prime minister’s case, he was reading “Nothing Less than Victory: Decisive Wars and the Lessons of History,” published in 2010 by historian John David Lewis, who died in 2012 at the age of 57. Netanyahu is said to be a voracious reader, preferring non-fiction over novels. Time may tell whether Lewis’ book influences the prime minister’s future military thinking. The premise of Lewis’ book is that aggressive military campaigns using decisive force are capable of winning wars and establishing lasting peace, while in contrast defensive military operations have led to indecisive outcome and prolonged hostilities. The book examines six wars from various periods, from antiquity to modern times.